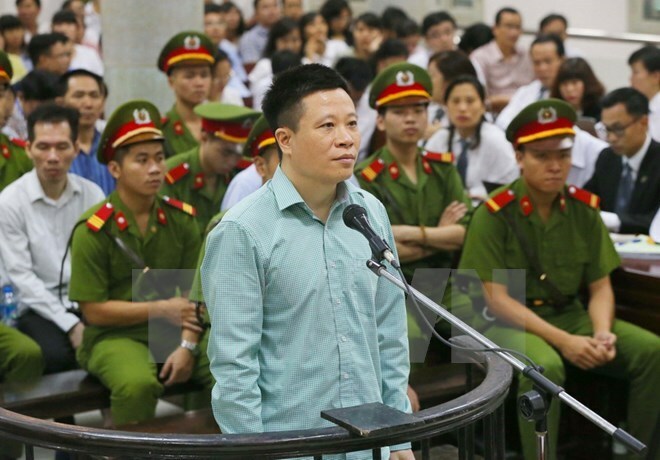 Hanoi (VNA) - The People’s Court of Hanoi on August 28 opened the first instance hearing for former Chairman of the Board of Directors of the Ocean Commercial Joint Stock Bank (OceanBank) Ha Van Tham and other 50 defendants for serious violations of the State’s monetary policies. The trial saw the largest number of people being summoned, numbering 727, including civil plaintiffs, those who were involved in interests and duties, witnesses, and assessors. In one of the biggest economic crime cases in Vietnam, Tham and other 50 former executives and employees of the bank are facing charges of appropriating assets, breaching loan regulations of credit institutions, abusing positions and power while on duty, and intentionally acting against State regulations on economic management causing serious consequences. Among 51 defendants, seven were detained and 44 others were out on bail. Of 57 lawyers defending the defendants, two pled for Tham and four others defended former OceanBank General Director Nguyen Xuan Son. Three were absent due to health reasons, including former Chairwoman of the Board of Directors of Phu My investment and development company Hua Thi Phan, former Director of OceanBank’s accounting and domestic transaction unit Vu Thi Thuy Duong, and former Director of OceanBank’s Au Co transaction office Nguyen Viet Hien. According to the Supreme People’s Procuracy, when working as OceanBank’s Chairman of the Board of Directors, Tham and his accomplices made a lot of credit-related violations causing losses for the bank and seriously affecting the State’s monetary policies. Their violations resulted in losses of nearly 2 trillion VND (88 million USD) for the bank. Specifically, while holding the highest position at the bank, Tham directed his subordinates to approve a loan for former Chairman of the Vietnam Construction Bank’s Board of Directors Pham Cong Danh without guaranteeing the lending conditions, collateral and proper purposes, thus causing an economic loss of nearly 350 billion VND (15.3 million USD) for the bank. He had directed the bank’s staff to pay interest rates outside of the mobilising deposit contracts for customers. Tham was arrested in October 2014. Under Tham’s direction, OceanBank’s bad debts climbed to nearly 15 trillion VND (666 million USD), with pre-tax losses reaching more than 10 trillion VND as of March 2014. Son, who was also representative of the capital contributed to the bank by the Vietnam Oil and Gas Group (PetroVietnam), had worked with Tham to decide to illegally pay interest rates outside deposit contracts to customers. Although Son was moved to work as leader of PetroVietnam from May 11, 2011, he still directed former director general of the bank Nguyen Minh Thu to continue paying the extra interest. Abusing his prestige, position and the dependence of OceanBank on PetroVietnam, Son withdrew more than 246 billion VND (10.69 million USD) from the bank. The OceanBank case is one of the six biggest economic crimes that the Central Anti-Corruption Steering Committee was asked to bring to trial by the first quarter of 2017.